Pancakes. Hotcakes. Griddlecakes. Flapjacks. No matter what you call them, they are a great meal anytime of day (who doesn’t like breakfast for dinner?). Pancakes also contain problem ingredients for many with stomach issues and dietary restrictions. Luckily, there are alternate options that are delicious. We came across King Arthur Flour at our local Food Lion. 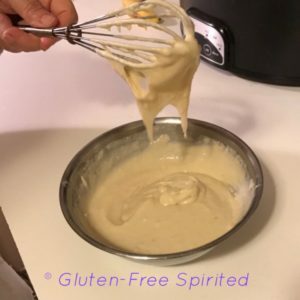 The brand has Easy to Prepare Gluten Free Pancake Mix. The company was founded in 1790 when Henry Wood began importing flour from England and sold it under the name Henry Wood & Company. According to their website, it was the first flour company in the US. In the 1820s, the company began milling flour using American-grown wheat. Roughly 75 years later, the company changed its name to King Arthur Flour. If you have time, take a few minutes to read a timeline of the company’s history, including why they became employee-owned in 2004 and how they’re involved in the community. King Arthur Flour offers a variety of products, including gluten-free products. They are Certified Gluten-Free, Non GMO Project Verified, kosher, and contain no preservatives. 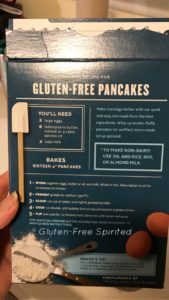 The gluten-free pancake mix is also soy-free. To make the pancakes dairy-free, use oil along with almond, rice, or soy milk. 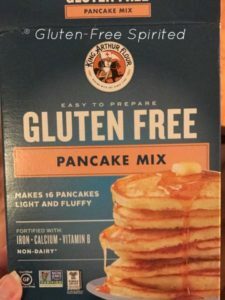 King Arthur Flour Easy to Prepare Gluten Free Pancake Mix lives up to its name. 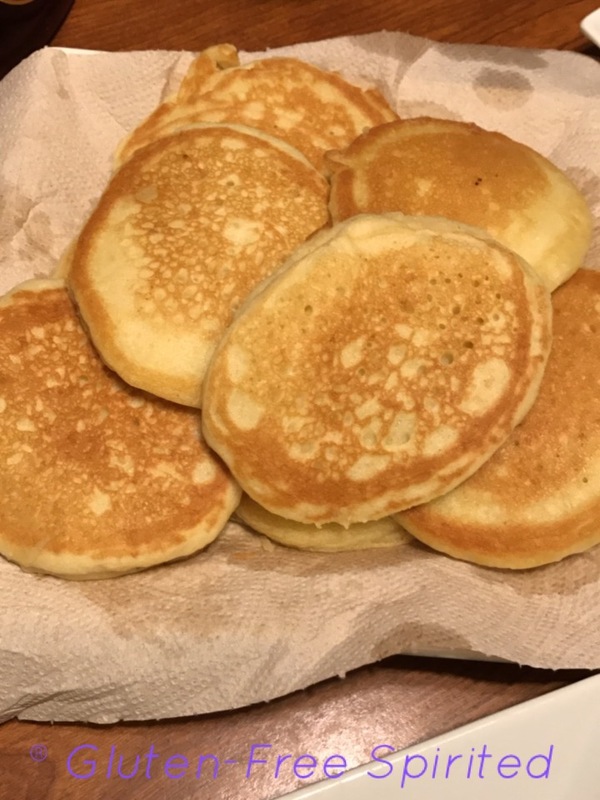 See how easy it is to make these dietary restriction friendly pancakes? -Whisk together eggs, butter/oil, and milk. Then, whisk in mix and allow butter to sit for 10 minutes to thicken. -If you’re using a griddle, preheat to medium (350 degrees F) or preheat stovetop. -Cook 1-2 minutes until bubbles form on top and bottom is a golden brown. -Flip and cook for 1-2 minutes more. Put some wrist action into it while you whisk the batter. Pro tip: An ice cream scooper makes mini pancakes. *For Half Batch: Make batter as directed using 1 1/3 c mix, 1 large egg, 3 tbsp. melted butter or 2 tbsp oil, and 1 c milk. *Pro Tip: Make your pancakes even more delicious by ADDING CHOCOLATE. You are welcome. 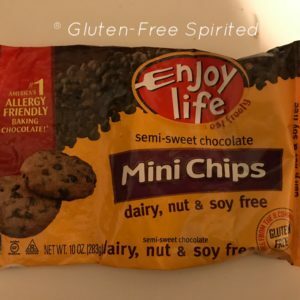 *praisehandemoji* Enjoy Life has Semi-Sweet Mini Chocolate Chips that are dairy-, nut-, soy-, gluten-, peanut-, potato-, casein-, wheat-, fish-, egg-, sesame-, fish-, and shellfish-free. Little drops of chocolatey goodness. You’re going to thank me for this; trust me. Verdict: We’re fans! They were like soft, fluffy, yummy clouds. The pancakes were scrumptious! If you liked this recipe, you’ll also like these dietary restriction friendly tacos, penne pasta, & cheezy mac. Subscribe below so that you never miss an update and follow GFS on social media! Great recipes! 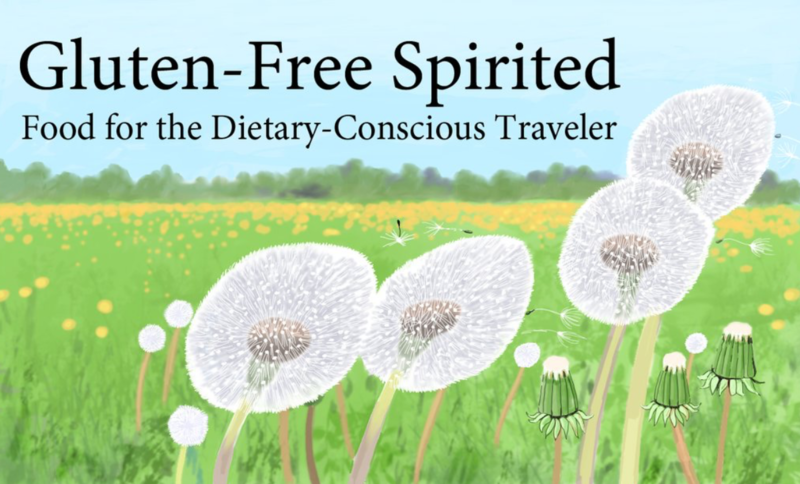 I am going to try for sure…I always struggle to find gluten free option! Thank you, Paola! I hope that you like them. 🙂 Let me know if you make any of them! I’ve never had buckwheat pancakes before. Sounds intriguing! This is really great to know! 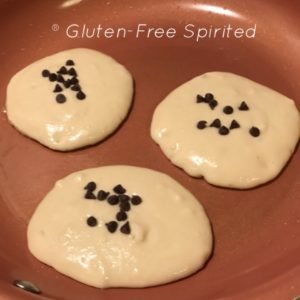 I don’t have gluten allergies, but I have friends who do, so this is something really useful to keep in mind if I ever cook breakfast for them! I’m happy to hear that, Jin! These pancakes look sooo good! I have been considering going gluten free to see if it helps resolve many of my digestive issues. They were really yummy! My mom & I aren’t gluten-free, but my sister is & we loved them as much as she did. That many not be a bad idea. My sister had to go gluten-,soy-, & dairy-free per her doctor to help manage her IBS. Hopefully you’ll get to the bottom of it soon! I have used King Arthur flour in my cooking, it an excellent brand. These pancakes looks very fluffy and delicious. We’re definitely hooked on them now! Darn it, i just finished eating – and i’m looking at how yummy these things look! i’m not allergic to gluten, but I’d definitely try these! They look so yummy! What I do to make my pancakes healthier is replace regular flour with plantain flour. That’s a really good idea. Thanks for the tip! I really need to see if I have a problem with gluten. I have this phlegm in my throat that WILL NOT go away. I’m going to start removing different products from my diet to see what the culprit is! That might not be a bad idea. I hope you’re able to figure it out soon! These pancakes looks amazing and i can just imagine how great they taste too. It’s great to know that there’s so many dietary option to choose from these days. I’m not allergic to gluten but I like to try some new things especially it’s pancake related. These pancakes looks so good! It’s been great to find so many options for my sister. I’m not gluten-intolerant either & we tried this recipe for my sister. They were so good! You’d never know that they weren’t “regular” pancakes. This recipe is awesome. I have to try it out next time my nephew and niece are visiting. These look delicious. 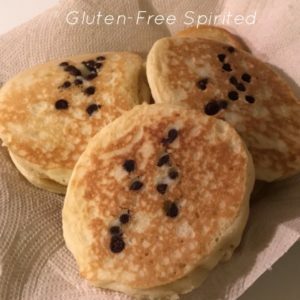 I use another gluten-free brand, but am always looking to try something new! I’ve never made chocolate chip pancakes, looks easy enough! Thanks for the idea. This is the first time we’ve tried King Arthur’s. What brand do you use? You’re welcome! 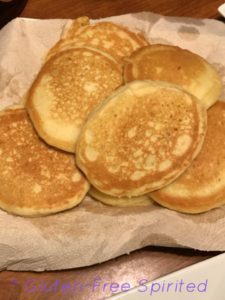 Yummy pancakes are one of my favorite breakfast food ever, I would love to try gluten free ! It’s really good! They taste exactly like “regular” pancakes! 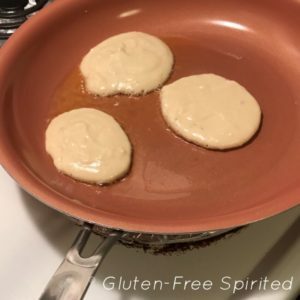 Glad to know that there is a brand for gluten-free pan cake available in the market! Thanks for sharing your recipe with us! I’ve many vegan friends and I’ll share your post with them! Thank you for sharing it with your friends, Ana! This looks like a yummy, nutritious, and friendly pancakes. Worth to recommend to everyone. Wow they look so easy to make and I like the idea to add a little something to make them unique…I would definitely add strawberries and bananas….I am wondering if I can make them with no eggs?!? It’s so easy and quick! Strawberries and bananas are a good idea. Maybe an egg substitute (like Veganeggs) would work.